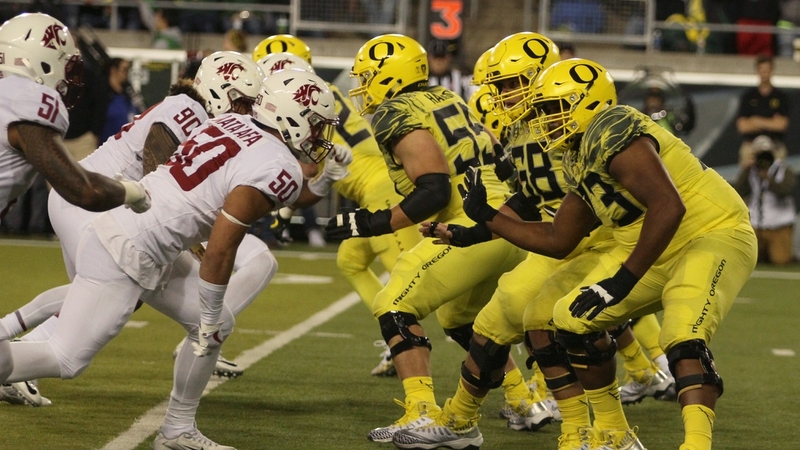 The Oregon offensive line will be tested by a physical Stanford front seven in Palo Alto. Three of five with the Week Six selections lifts the current tally to 41-10 on the year. A full docket of Pac-12 games gets started a day early with Cal hosting Washington State on Friday. First, a look at last week’s results. Wire-to-wire Trojans and the fallout is still reverberating off Mary’s Peak and beyond. Head coach Gary Anderson vacated his contract after less than three years at the helm in Corvallis, leaving Cory Hall – who had been responsible for the DB’s – as interim. A lot to unpack… what does this say to a prospective employers in the case of Anderson and equally, what does this say about the state of the program to his possible replacements. There is nothing good that can be said of this. Washington opened up a 24-0 lead by the half and was never threatened. Jake Browning tossed for two touchdowns and Myles Gaskin ran for a pair while the Husky defense held the Bears to 93 net yards offense… 143 passing and -40 on the ground. Ouch. An old fashioned slobber-knocker in Rice-Eccles Stadium. Total yards were nearly even with Utah gaining 382 total yards to Stanford’s 384. A pair of Troy Williams interceptions hurt the Ute’s cause but the real damage was done by the Cardinal’s Bryce Love. The nation’s leading rusher gained 150 yards on 20 carries highlighted by a 68-yard house call in the fourth quarter. A rough outing for the Ducks and freshman quarterback Braxton Burmeister. The Cougar defense bottled up Oregon’s offense from late in the first quarter while WSU quarterback Luke Falk tossed for 282 yards and three touchdowns. Burmeister did connect with Jacob Breeland on a pretty 30-yard strike to give the Ducks an early 10-7 lead but it was all Cougs after that. Arizona held on for the win despite 21 fourth quarter points by the Buffaloes. Wildcat quarterback Khalil Tate ran for a record 327 yards on 14 carries with touchdown dashes of 58, 28, 47 and 75 yards. After a 3-0 start to the season, Colorado has dropped three straight Pac-12 contests. One of these teams will get its first Pac-12 win of the year. It won’t be the Beavs. Colorado 28-13.